The team behind crowdfunded website Byline is set to launch a new online venture and print newspaper to follow stories that other titles “don’t have time to do, or for some reason have ignored”. 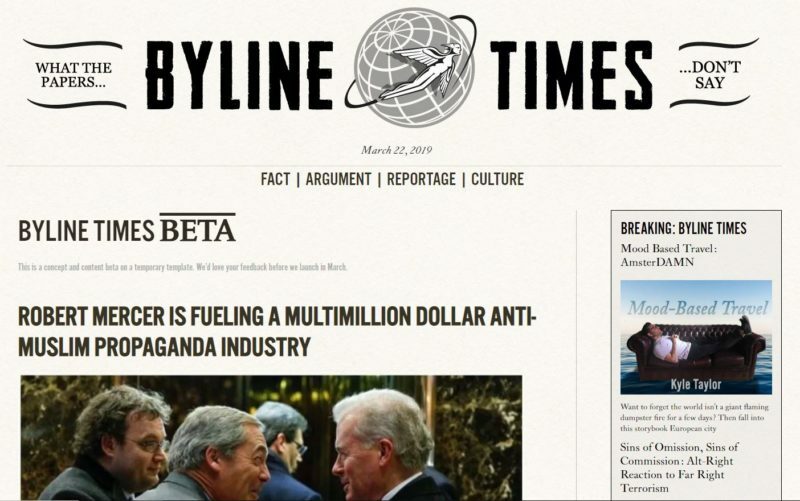 Byline Times is currently in a beta version, publishing about five stories a day, but will be replaced by a permanent website this month as well as a weekend print edition by May. Byline co-director Peter Jukes (pictured) told Press Gazette the new website is “an evolution with a brand connection” to Byline, but also “a move on”. The website has four part-time editors and about half of its budget will go on freelance commissions with a focus on four sections: fact, reportage, argument and culture. Jukes said a survey of 800 people through the temporary Byline Times site had indicated that readers “massively loved” the idea of more investigations and the separation of fact and argument into different sections to “restore trust and authority”. Investigations already launched on Byline Times include Kick Back, looking into corruption inside the world of football, In Contempt by Alex Varley-Winter about “executive overreach” in Parliament, and Justice Trap by Jon Robins looking at failings inside the UK criminal justice system. The survey also showed that readers were keen to read stories with an angle that “other people haven’t got”, said Jukes. Byline Times hit 100,000 unique visitors last month and is now getting a steady 3/4,000 uniques a day, according to Jukes, who described it as a “good base to begin”. He wants to reach 250,000 unique users a month by the summer and 500,000 by the end of this year. The venture is backed by the same investors as for Byline and Byline Festival, but Jukes said Byline Times aimed to become independent within two years, while Byline will be “slowly mothballed” over the coming years. Jukes said Byline Times is “completely different” from Byline.com, which is crowdfunded with no top-down editorial control. The new website will be more like a “proper organised news site”, he said, and funded by a mixture of subscriptions, advertising and events. Jukes and his team are also expanding into print for the first time with a weekend edition to be published every Saturday morning for subscribers. Subscriptions will open up in the coming weeks, ahead of the launch. 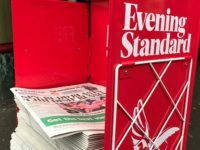 The weekend newspaper will fill a gap left behind by the closure of the Independent on Sunday in 2016, said Jukes, who added that Byline Times would strive to have a similar feel to FT Weekend. Hardeep Matharu, a Byline Times contributor and editor specialising in social affairs, told Press Gazette the team wanted to try a print product because “there is an appetite for a certain type of news”, although she acknowledged that appetite was decreasing. “I think there is still something to be said for a type of journalism that is really investigatory, really considered, really relevant to the zeitgeist, and taking the time and consideration to put something together in a paper form that people can take away with them, read, come back to, read again. “I think what we’re trying to do in a way is say that that isn’t dead. The newspaper will be sent to paying subscribers, while the website will be free to access with a partial paywall for premium content being considered for the future. How to engage a wide audience? Matharu said one of the most important challenges for the team was to find ways to engage a wide audience and get them to care about social issues that “don’t immediately have a top line or headline that is catchy or doesn’t draw the attention it should”. 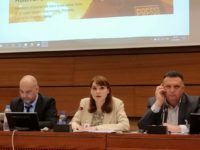 “What we’re looking to do with Byline Times is really dig down and investigate these pressing social issues, many of them to do with justice, or a lack of, which for one reason or another are not being widely or extensively reported on elsewhere,” she said. One way to do that will be by launching a news podcast to run alongside Byline Times’ written journalism, she said. Eventually the team of four will pass Byline Times on to a younger generation, Jukes said. “The older generation think young people don’t trust news, but they love news and love true crime and listen to podcasts,” he said, claiming 65 per cent of listeners to his Untold: The Daniel Morgan Murder podcast were under 35. With Jukes at the helm, why not just call it the Tin Foil Hat Weekly? Is he still running stories by Mark Watts? How is Jukes currently paying his contributors? Or are they all working for free?